Join us as we discover the stunning shores of Lake Garda on this walking holiday in Northern Italy. With three included walks we can seek out some of the area’s most beautiful vistas whilst leaving us plenty of free time to relax or explore this fascinating region further. 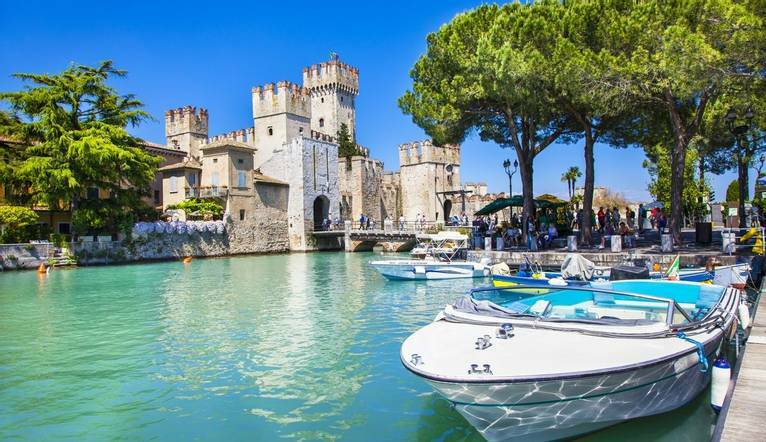 Captivating Lake Garda has attracted the rich and the famous to its shores for many years. At 370 sq km, it’s the largest of the Italian lakes, spanning three of Italy’s most beautiful regions Lombardy, Trentino, Veneto. The scenery has a Mediterranean feel to it, with vineyards, olive groves and citrus orchards dominating the landscapes, mainly due to the region’s uniquely mild microclimate. Our three leisurely half-day walks will take us through the region’s stunning landscapes, and there will be time in between to explore further; take a stroll along the resort’s delightful promenade or ferry-hop inbetween the lake’s charming, colourful towns. Alternatively, do nothing more than enjoy leisurely lunch on its shores watching the world go by! This walk takes us firstly along the stunning shores of Lake Garda, until we reach the magnificent Villa Canossa. We continue to San Vigilio, to admire the stunning ancient villa, host to royalty, nobility and film stars. The route rises to a panoramic spot above the legendary Baiadelle Sirene, before entering the woods where there are still Bronze Age ancient graffiti carvings to admire. From here, a panoramic walk takes us to Scaligero Castle, where we will enjoy lunch at a local trattoria before taking a relaxing ferry ride back to Garda. Our walk rises gently uphill to the ancient monastery at Rocca San Giorgio. From here the trail enters the woods leading to the beautiful viewpoint at Rocca Vecchia. From here a stepped trail leads us back to base, passing statue of the Madonna, constructed to protect the town of Garda. This charming walk passes through the beautiful Valle dei Mulini before we reach the small hamlet of Castion Veronese, location of the stunning Villa Pelligrini Cipolla (1760). From here the route takes us to the picturesque villages of San Veroloand Costermano, from where we return downhill to Garda. The week had a good balance of walks and free time to explore the area. I would thoroughly recommend this holiday! Our comfortable hotel has an enviable position in the historic centre of Garda, and just 300 yards from the lake itself. Hotel facilities include a roof terrace, a bar in the dining area. Free Wi-Fi is available. All the rooms are equipped with en-suite bathroom, air-conditioning, satellite TV and safe. The transfer time from Verona Airport to our hotel is approximately 45 minutes to 1 hour , depending on weather and traffic. Three half day guided walks are included in the programme. Your walking guide will advise you in resort of the daily programme. The walking programme is graded as Easy to Medium and you can expect to walk between 8 to 12km per day, with some ascents/descents, rough underfoot terrain. Length approx. 8 km - easy terrain.